The migrants were being smuggled from Africa to Yemen. AT LEAST 56 people have drowned over the past 24 hours, and dozens remain missing, after human traffickers forced 300 African people off two Yemen-bound boats and into the sea. Survivors – all Ethiopian and Somali migrants – managed to make their way to Shabwa, a southern province along Yemen’s Arabian Sea coastline, the International Organisation for Migration said. The war in Yemen has left over 8,300 people dead and displaced millions since 2015, but the impoverished country continues to draw migrants from the Horn of Africa seeking work in prosperous Gulf countries further north. At least six people drowned today after human smugglers forced 180 Ethiopians off their boat and into the choppy waters of the Arabian Sea, an IOM spokesperson told AFP. Thirteen people remained unaccounted for, the spokesperson said. The majority of the migrants appeared to be teenagers and young adults. Yesterday, traffickers also forced more than 120 Somali and Ethiopian migrants into the rough seas off Yemen to avoid arrest by local authorities, leaving at least 50 dead and 22 missing, IOM reported. IOM teams, working with the International Committee of the Red Cross, found the bodies of 29 migrants in shallow graves along the coast of Shabwa, currently under the control of Yemeni troops backed by the United States. They had been buried by survivors. “The smugglers deliberately pushed the migrants into the waters since they feared that they would be arrested by the authorities once they reach the shore”, an IOM emergency officer in Aden, where the Yemeni government is based, told AFP. Laurent de Boeck, IOM’s Yemen mission head, said the boat’s crew immediately returned to Somalia yesterday to pick up more migrants headed to Yemen on the same route. 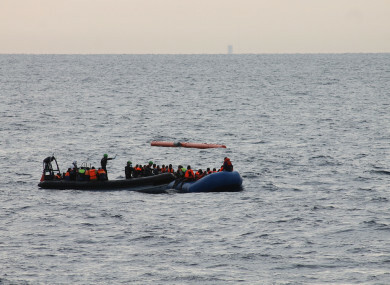 He described the forced drownings as “shocking and inhumane”. “The suffering of migrants on this migration route is enormous. Too many young people pay smugglers with the false hope of a better future,” he said. Long the Arab world’s most impoverished country, Yemen has all but collapsed in what the United Nations has called the “largest humanitarian crisis in the world”. Years of fighting between the Saudi-backed government and Shiite Huthi rebels allied with Iran have been compounded by a cholera outbreak that has killed almost 2,000 people and the looming threat of famine. The IOM estimates some 55,000 migrants have however left the Horn of Africa for Yemen since the start of 2017, more than half of them under the age of 18. The journey is particularly dangerous at this time of year due to high winds in the Indian Ocean. Despite the war, smugglers – who are highly active in the Red Sea and the Gulf of Aden – have continued to offer passage through Yemen, which shares a land border with Saudi Arabia. In March, a helicopter opened fire on the vessel carrying over 140 Somali passengers in the Red Sea off the Yemen coast, killing 42 civilians and wounding another 34. A confidential UN report, seen by AFP in June, said the attack constituted a violation of international humanitarian law and was most likely carried out by a Saudi-led military coalition backing Yemen’s UN-recognised government. The coalition has denied that its forces were operating in the area when the vessel carrying Somali refugees came under attack. Email “At least 56 people die after human traffickers force 300 off boats and into the sea”. Feedback on “At least 56 people die after human traffickers force 300 off boats and into the sea”.